I’m a Greyhound mom – that’s what I do and practically who I am. I volunteer with the rescue group where I got my two Greyhound sisters, and on occasion I foster newly rescued Greyhounds. Before that, I was a Beagle mom for 16 years, so my dog experience has been with hounds. That is until early one morning in December. I was eating breakfast at my favorite restaurant and looked out the window to see a reddish colored dog running down the middle of the street followed by a woman in an SUV. As any dog lover would do, I sprang into action. By the time I got outside to help, the dog had made its way to the sidewalk, but was precariously close to the street. I crouched down and called the dog and much to my surprise, she came over to me practically crawling in fear. The woman in the SUV pulled into the parking lot and said she was trying to protect the dog from being hit by a car. We agreed I’d take her. I realized, and everyone around the restaurant confirmed, the dog was a pit bull. One woman wondered why I wasn’t afraid of the dog. It’s not my nature to be afraid of dogs, and I believe in most cases dogs will return the respect you show them. Also, I believe in the saying that there are no bad dogs just bad owners. I loaded my new charge into the backseat of my car, which already has harnesses installed for transporting my Greys. We drove around the neighborhood surrounding the restaurant looking for any sign that somebody had lost a dog – an open gate, people searching the streets, etc., but to no avail. The dog’s collar was way too tight and she wasn’t wearing tags. Later my vet confirmed she also did not have a microchip. When I brought her home, I set up a wire crate in my garage and attached an exercise pen, and then I decided to call her Honey. This setup turned out to be her home for the next 45 days. It was clear, and became even clearer as time went by, that Honey had been mistreated. I kept her in the garage because I never found the right time to introduce her to my Greyhounds. They can team up and play rough, which could be misunderstood by a timid dog. Then once Honey was no longer fearful, she became possessive of me – actually more “Stockholm syndrome” than possessiveness. Next, I attempted to take her to the animal shelter in my county, twice. But each time I just couldn’t because her eyes melted me. Those soft eyes were so needy yet trusting that I couldn’t let her down by just dumping her at the county shelter. Then I started my e-mail campaign. 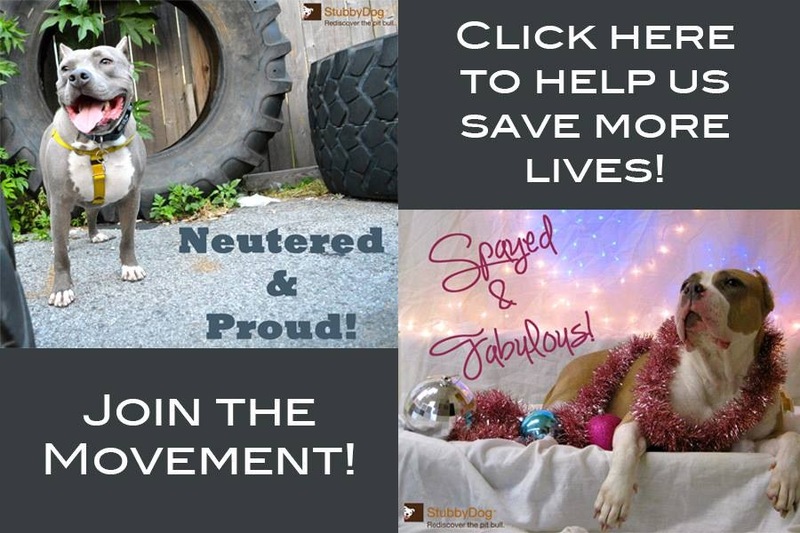 I contacted the pit bull rescue for my county. Although they couldn’t help me, they provided a list of rescue organizations that could possibly assist. I sent Honey’s picture and story to most of them, but still had no luck except for a very kind woman from one group who educated me on the current plight of the pit bull. 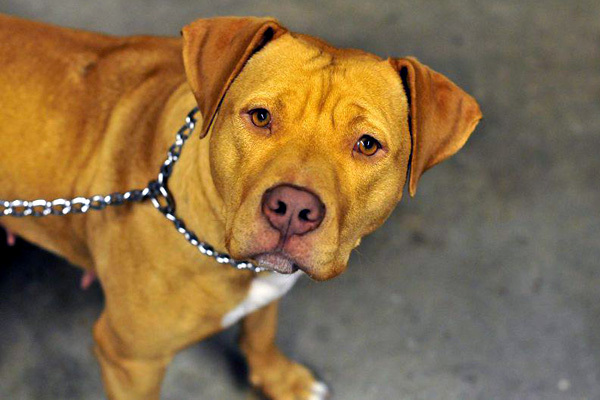 I knew nothing of the breed, only that my heart would break for the dogs whenever I saw them on the evening news with a noose around their neck being dragged away by animal control. I just knew it wasn’t the dog’s fault. 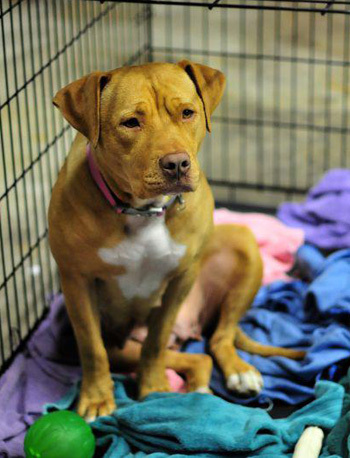 Among the many things the rescue woman told me was that Honey would most likely be put down after a week or so at a shelter because the shelters are so overcrowded with pit bulls. I thought of those eyes and was happy I hadn’t taken her. I then made it my mission to find her a home. When I took Honey for her series of shots the vet thought she was probably between a year to a year and a half old – just a pup. I set an appointment for her to be spayed, which was 30 days away, and in the meantime decided to make her into a doggie anybody would want to take home. Honey clearly hadn’t been socialized and was even afraid of grass. Much to my surprise, when Honey first saw grass, she jumped over it from the sidewalk to the street. She eventually learned to use it to do her duty and even began to grass dive like a real doggie. After Honey started trusting me, her personality revealed a sweet, enthusiastic dog that was eager to learn. I bought her an indestructible rubber ball, and we began to play fetch. She quickly learned to sit on command while being leashed and when receiving a treat. She even learned the “no bite” command when we played ball. All Honey ever really wanted from me was to be loved. As time went by, I began to think I was never going to find a suitable home for Honey. The breed’s reputation clearly preceded the dog. So you can imagine my surprise and disappointment when I asked my landscaper if he was interested in taking her – after he told me he was planning to get a Boxer – and he responded, “I can’t, I have children.” I explained that Honey would love to play with children, but he said no because she was a pit bull. Ridiculous, I thought, and what a shame for such a wonderful animal to have such an undeserved reputation. But this story has a happy ending even after a false start. I thought Honey had found a home with a local woman but, unfortunately, she returned her to me after only a week for reasons not related to Honey. Honey seemed brokenhearted, and I was extremely distressed by this turn of events. I posted a distress call on my Greyhound rescue group’s Facebook page, and before the evening was over, Christian, a wonderful man who had adopted my last foster Greyhound, said he could find Honey a home. 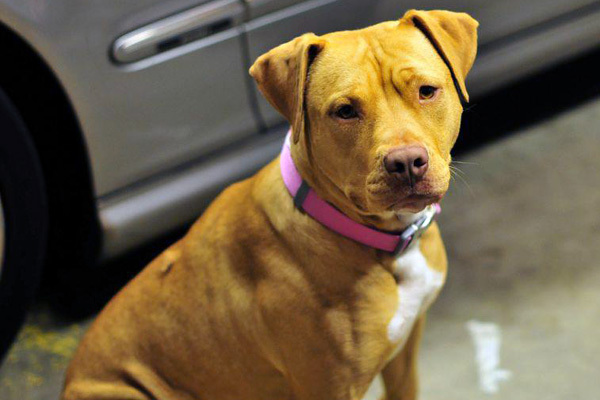 To make a longer story short, Honey was shipped via animal transport van to Texas, where she now lives with Katy, a dog trainer, who has a pit bull of her own named Tonka. Honey now happily lives with Katy and Tonka awaiting her new family’s return from Alaska, where he is assigned with the U.S. Army. A happy ending, for sure! Honey is beautiful, thank you from the middle to the top of my heart f(the bottom is is where all the nasty things settle) or taking Honey in! Prayerfully Honey has found a furever home and will thrive many, many years to come! @theprettychic She has found a home Kelli, and she is doing great!